Less difficult tracks lead mostly on roadways and roads. It can also run on maintained forest paths. Tracks are not marked out in a special way for bikers; you only need a touristic map to complete these tracks. 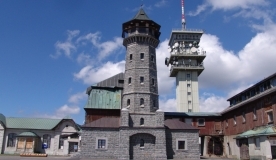 The destination of this tour is Blatenský vrch (1043 m above sea level). On its peak there is a stone lookout tower which provides a picturesque view over the Ore Mountains. Close to Blatenský vrch there is the Nature Trail Vlčí jámy (500 m) which shows remnants of tin mines where ice and snow usually remain until summer. On this trail we recommend to take a stop on the hill Blatenský vrch. On the peak of Blatenský vrch is a stone lookout tower and you will have a beautiful view over whole Ore Mountains. Close to Blatenský vrch there is Nature Trail Vlčí jámy (500 m) with remnants of tin mines where ice and snow usually remain until summer. Take a shortcut on this trail by taking Mílovská route from Myslivny to Červená liška. This shorter trail is 30 km long. You will find many places of interest on the road. It will lead you through natural park Zlatý Kopec, around Holubí skalky rock walls, pass the village Potůčky with a famous market and a part of trail goes along the marvellous water channel Blatenský příkop (Blatná Ditch). Go through the town Horní Blatná and head to Nové Hamry. After two kilometres turn right onto the asphalt biking route No. 2000 which is marked by yellow triangle marks. This route is called Stará Bučínská and bends Vlčí, Zaječí and Liščí hills to the village Jelení. Biking route continues to the villages Přebuz and all the places mentioned above and then goes back to Boží Dar. The track is longer and more demanding compare to other trails. The surface varies a lot but you will be treated with spectacular views. Take the first part of trail; Boží Dar – direction border crossing – Neklid – Klínovec saddle on the road. In the saddle turn right onto the road leading to the peak of Klínovec. After 500 meters link up to green-marked cycling track which goes across Klínovec ski slopes and connects the Pašerácká stezka track. This track leads back to Boží Dar. There are two big troublesome and long hills (0. – 3. km, 12. – 15. km). On a clear day, when the visibility is good, you get the most beautiful view on the Ore Mountains on this track.